Place Based Learning Curriculum Implementation Day! Thank you so much for your support in our recent Place Based Learning Curriculum Implementation Day! We were greeted by the spectacular sunrise, and explored PBL in one of many beautiful Burnaby locations: Burnaby Rowing Lake Pavilion. Our B. 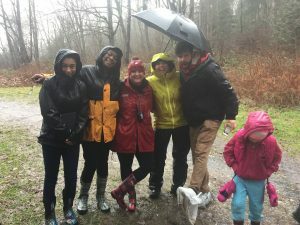 Outside Local Environmental Educators Association, a Burnaby chapter of EEPSA,was founded in June 2016 by a group of Burnaby place-based educators who wanted to connect and create change in our district, and it continues to grow. 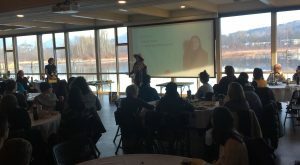 By partnering with the Burnaby School District Development Team and EEPSA, we were able to put together this inspiring day of powerful speakers, community partners, and inspiring colleagues. We want to offer a huge thank you to our members and organizers. Your time and energy made this event happen, and gave the opportunity to connect educators across our district. Thank you to all our new and returning members for being a part of this place-based learning group. Your work is inspiring and appreciated. 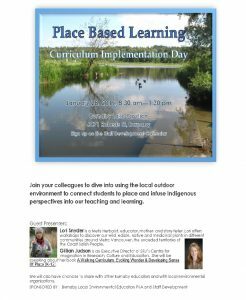 We are very excited to announce our first Burnaby Place Based Learning Conference will be taking place on the Jan. 28th Curriculum Implementation Day at Burnaby Lake Rowing Pavilion! We are thrilled to be joined by two amazing key note speakers, Lori Snyder and Gillian Judson. 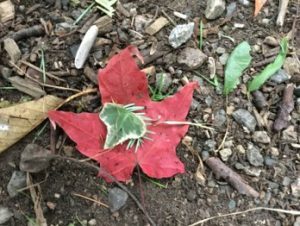 Lori Snyder is a Metis Herbalist, educator, mother, and story-teller. 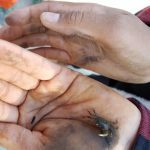 Lori offers workshops to discover our wild, edible, native and medicinal plants in different communities around Metro Vancouver, the unceded territories of the Coast Salish People. Gillian Judson is an Executive Director of SFU’s Centre for Imagination in Research, Culture and Educaiton. She will be speaking about her book A Walking Curriculum: Evoking Wonder & Developing Sense Of Place (K-12). 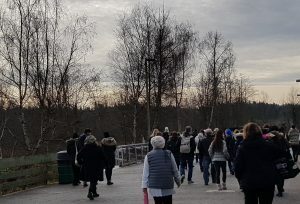 During the day, there will also be opportunities to connect with community partners and inspiring Burnaby teachers who have prepared resources and ideas to share with you. A big thanks to Burnaby Local Environmental Educators LSA, Burnaby School District and EEPSA for being our event sponsors for making this day possible! We hope you will choose to come and explore with us! How Does Place Influence Us? 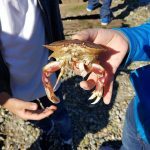 Grade 4/5 classes from University Highlands had the opportunity to bus to Barnet Marine Park and explore the plants and creatures we found there. 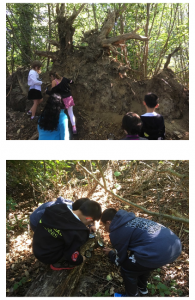 We wondered how the plants and animals would be different from the ones we had been studying on Burnaby Mountain. Would different elevations influence who lived there? How does the proximity to the ocean change the landscape? 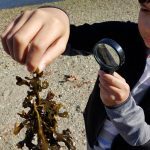 With our field experience notebooks, our magnifying glasses, and our curiosity, we made observations and posed questions about what we found on the beach and in the forests. Even though many of us had been to the park a number of times, we noticed that we were able to explore it with a new lens and make exciting discoveries. How Do We Carry the Land? 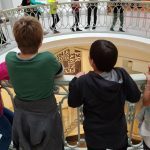 When planning your inquiries, consider including a field trip to the Vancouver Art Gallery. 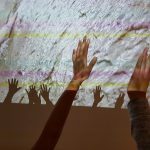 This past fall, classes explored the gallery created by Ayumi Goto and Peter Morin, and featuring 6 other celebrated artists who inspired and mentored them. In this exhibit, place and culture were explored and shared between the artists and with us. 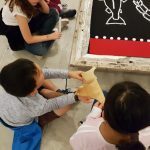 Experiencing their art and stories, helped us to understand their cultures, and explore important themes of Canadian history. 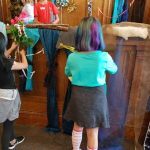 Then, together, we created a collaborative art piece, in which we changed and reclaimed space in the art gallery, which previously had a been a court room. A final layer of performance art was added, as our process was filmed and then turned into a time-lapse video. 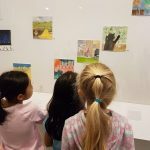 Our experience at the art gallery was beautifully composed. 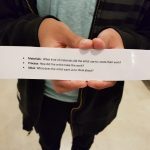 This was one of many incredible exhibits that the Vancouver Art Gallery offers, so often exploring themes of place and diverse ways of knowing. This year, division 8 has undertaken a project that started with the question “how can we make our forest more accessible for our community?” This began a long inquiry process into who owns the land, what community resources we can pull from, and what there is in the forest! We found out some very interesting information including the fact that there had previously been a house on the land before it was bought by the city. 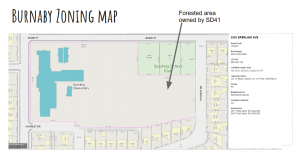 We also found out that originally, our school was planning on building a track on the forested area that neighbours our school ground. Some of the most interesting information that we found out is that the forest is overrun with invasive species. 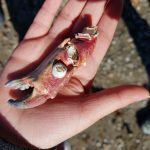 We researched these species and we invited community members to teach us how to remove those species to make room for native species to regrow. We have since begun removing species and creating a clearing in which we hope to have a learning space. This will be a gathering a rea for classes to share what they are learning in the forested area. The potential topics range from habitats, language arts, social studies and physical education. 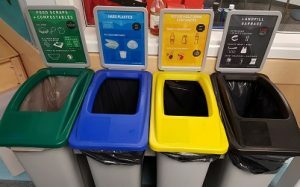 This year, students at University Highlands Elementary inquired into how their actions influenced their local and global communities.In September, we examined our spaces and wondered how we might teach and re-imagine our waste and recycling systems. We became experts on recycling and composting in Burnaby, and explored the value of reducing our waste through litter-less lunches. We were able to connect with Simon Fraser University to design our program based on their Zero Waste Initiative. After launching our own new Zero Waste systems at our December Celebration of Learning, students volunteer each lunch hour as Green Team Monitors to educate and help the members of our school so they can effectively use our new system, and understand the reasons why it is so important to care. This past Earth Day, we launched our Litter-less Lunch Campaign, encouraging students and community members to re-think and re-examine our choices when purchasing food and bringing it for lunch. How can buying in bulk and using reusable containers help us to reduce our waste? How can reducing and eliminating our single-use items make an impact? Every Thursday until the end of the year, we will be hosting a Litter-less Campaign to raise awareness and encourage our community members to notice their footprint and the consider ways they might be able to reduce it. 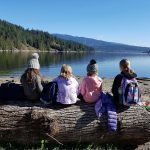 Please contact Kristina.Carley@burnabyschools.ca if you would like to learn more about their inquiry process, and to get powerpoint examples of introducing a new system and a litter-less lunch. “Going outside gives you freedom to think. Thank you for sharing your school’s story, Jolene Carlsen! What does rain taste like to you? Does rain taste differently under a cedar tree? How fast is the water moving today? Wednesday Wander happens even if staff forget their boots! 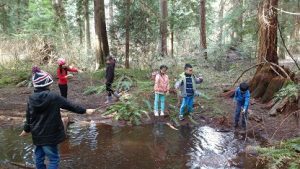 Every Wednesday, the K-1 classes at Forest Grove Elementary get together with the Strong Start and go for a wander and wonder in the forest. No matter the weather, everyone bundles up and troops out to enjoy the fresh air and explore the environment. On the day I visited with Dawn Howey, Ros Duchesneau and Tanya Nicoll, the weather could only be described as a deluge. But not even nature’s torrents could dampen the spirits of the students. They enthusiastically stomped through the puddles, explored the raindrops using all their senses, and took turns measuring the speed of the water by counting how long a stick took to traverse a tunnel. They investigated the area using magnifying glasses. They hiked up a hill to their usual story spot and talked about homes in the rain. 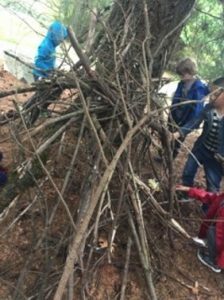 Forest Grove has turned this into a tradition–and it is connecting the students to their neighbourhood and nature. Monthly Walking Field Trip to Central Park is a Real Hit at Maywood! Getting outside is fun for Div. 4 and our buddy classes, here at Maywood Community! Once a month, Ms. Lanaway’s Gr. 6/7’s buddy up with two Gr. 1/2/3 classes and walk the 20 min to Central Park. We leave part way through lunch (after eating) and head along the Central Valley boulevard past the Metrotown and Patterson skytrains stations. Big buddies learn what it’s like to have the responsibility of a younger person in tow, making sure they stay close, hold hands and looking both ways when crossing the street, and minding bikers on the trail. It can be a big job for some of our big buddies! Once in the park, students get a reminder about pointing out (but not picking up) broken glass, needles, or “one-fingered” gloves. The three teachers always have on hand a garbage, neoprene gloves for picking up garbage, and very little else for this adventure. Other safety precautions include a quick scan and clean-up of the area early that morning (THANK YOU, Ms. Aprim and Ms. Gill) and a reminder of the boundaries (small pieces of coloured duct tape on trees). With safety reminders out of the way, students are free to explore how they wish. 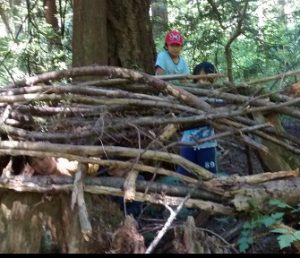 Time goes quic kly, as groups chase each other through the woods, students make forts and fishing rods, while others choose to sit and draw in their nature journals. I find it so interesting to watch how the students play: who is not quite sure what to do, which ones are nervous, and who takes flight – surely in their element! Sometimes students are taken by a teacher to the nearby washroom, but before too long, it is time to go and no one can quite believe we’ve been there for over an hour. Students are hurried along the trail as we try to make it back in time for the bell! Students are tired at the end of the day, but it always a fun time had by all. 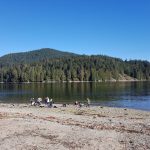 Canoeing at Deer Lake through the Burnaby Parks and Rec is an incredible opportunity for students. At Marlborough, several teachers trek over to the lake to participate in this program. 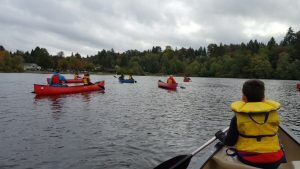 There is an option for up to 4 lessons, building on each other in technique in canoeing, as well as knowledge of the surrounding area. Although the program is suggested for grades 5 and up, one year, I took my grade 4/5 students and they had an amazing time. Because of the limited mobility of one of my students, we had parent drivers, but this would be an excellent opportunity for classes to walk here with enough time. And once you are there – take a look around! There are incredible opportunities for learning and exploring the forests and streams nearby. Bring a notebook, a magnifying glass, and your curiosity. A great resource for connecting your canoeing to the science curriculum is Chapter 3 “Power from the Land” from the new FNESC Science First Peoples Teacher Resource Guide for grades 5 to 9.